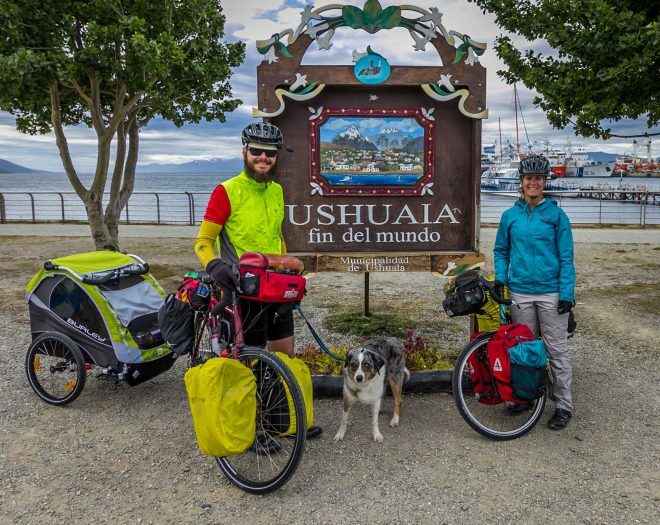 Since April 2015, my partner Dave and I, along with our Australian Shepherd, Sora, have crossed 25 countries by bicycle. 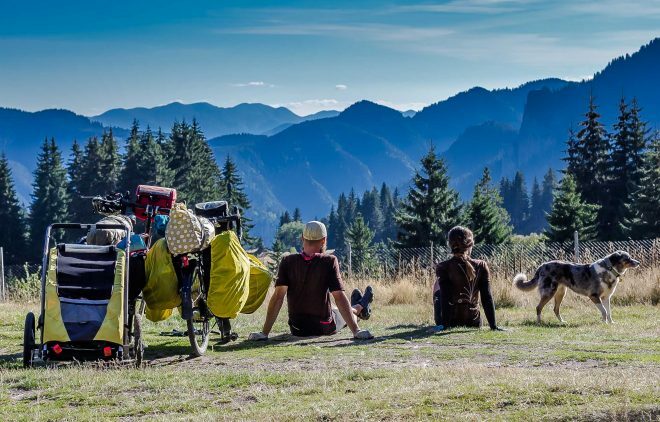 When Dave first proposed the idea of cycle touring with a dog, I thought he was nuts. How would we travel with her? Traveling by plane with a dog is expensive and traumatic for her. How are we going to find accommodation with her? Food? What if she needs to go to the vet and we’re in the middle of nowhere? What if we don’t want to or can’t bike and need to find an alternative means of transportation? 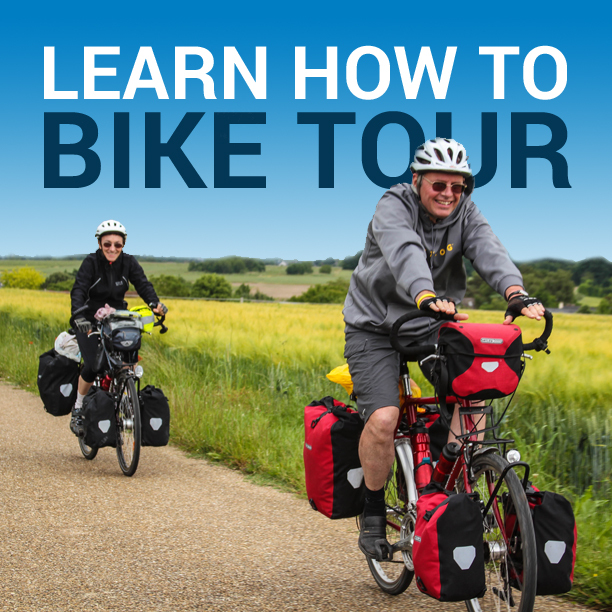 So many what-ifs swirled through my head before I finally gave in and agreed to embark on our cycle touring adventure. Leaving Sora behind was out of the question, so we were determined to figure out the uncertainties and make it work. It’s not always easy cycle touring with a dog. Sora weighs 40 lbs (18 kg) and her trailer alone adds an additional 27 lbs (12 kg), not counting the weight for her dog food, gear, and bed. It can be difficult to find alternative means of transportation or accommodations. We can’t always buy her the best dog food because many of the countries through which we have traveled do not sell high-quality food for animals. Acquiring her import/export documents can be a pain when crossing borders. Simply put, it adds more complexity to our trip. However, the positives far exceed the negatives. Like traveling with the warmest natural tent heater, ever. Or on demand snuggles when you feel exhausted after a long day on the road. I’m not sure we’d still be traveling if we hadn’t brought Sora along. 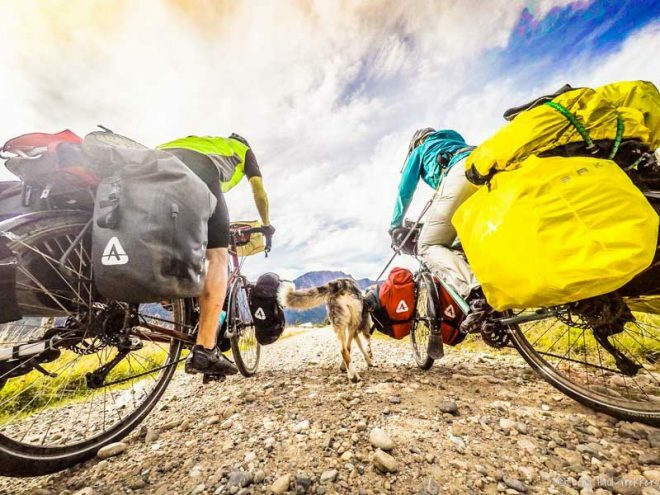 You can most certainly go cycle touring with a dog, and it doesn’t have to be an international trip, like ours. Many have asked how we travel with Sora by bike, so I’m offering the following advice to make your two-wheeled travel with your best friend a possibility – because no dog should be left behind. Depending on the size and fitness level of your dog, you will need some sort of carrier. We have used both a Burley Tail Wagon and currently use a Burley D’Lite trailer to chauffer Sora around the world. If your dog is small, a basket attached to your handlebars may suffice, just be sure he or she has some sort of protection from the elements and is securely attached. We line Sora’s trailer with her bed and have attached a sunshade made for RVs via magnets to make her ride more comfortable. We stop frequently, especially when the weather is hot to let Sora stretch, drink some water, and go to the bathroom. On low-traffic roads, Sora runs alongside, attached to our waists with a running belt. Depending on the outside temperature and the terrain, she will run up to 20 kilometers with us (about 11 miles). Sora has trained for ultra marathons with me, so I know that she can handle a lot of distance, and given that I haven’t trained for an ultra marathon in some time, we monitor her energy level and never push her beyond her limits. 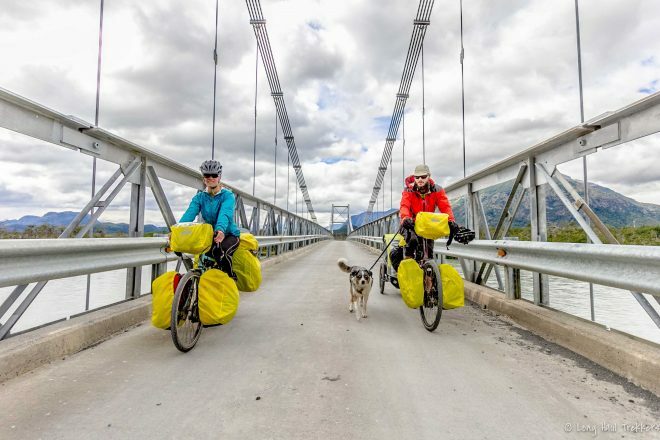 When we go bicycle touring with a dog, there are days when we need to advance quickly, for example when we need to exit a country in time before our visa expires. Or there are times when we are feeling tired or have some nagging pain and need to find an alternative means of transportation. Traveling with a dog can complicate this. In Europe, we could bring Sora on trains when we needed this extra boost of speed. But South America is an entirely different story. We can take her on buses, but they require a kennel and she rides below with the luggage, where there is no air and we do not stop. We refuse to risk her life and put her in that situation, so we look for private transfers or we try to hitchhike. Far more expensive than a bus, private transportation is often our only option with cycle touring with a dog, but Sora can ride in the seat next to me or at my feet. The van or truck can fit all of our gear and we can feel safe knowing that our bikes are with us at all times (though my iPhone was stolen on a private transfer in Perú, so there is never a guarantee). We always cover the seat or floor with Sora’s bed to minimize the amount of dog hair clinging to the seats and floor and if we know that we will be traveling by van, we brush Sora the morning before we leave. In South America, we have found success in traveling to popular tourist destinations with Sora in smaller transport or local buses. It is always up to the driver, but we have yet to be turned down. Call ahead if you can and explain that your dog is well behaved and will not relieve herself in the van. The main worry for the drivers is that your dog will get car sick, so if your pup is prone to feeling dizzy, you can give her some Dramamine. Sometimes, bike touring with a dog requires that you travel by air. Unfortunately, air travel with a dog is not fun. It’s stressful for both you and your pup. Sora is a certified Emotional Support Animal, so she can oftentimes fly in the cabin with us, depending on the airline and our destination (all flights originating to and destined for the US accept ESAs, as well as many South American Countries and Mexico). Call the airline before you book your ticket and tell them that you are bringing your dog. Ask them the requirements, the cost, and what size kennel you need. Be sure to schedule a long layover so your pup can get some rest, go to the bathroom and drink a bit of water in between flights. Lufthansa has a pet area during layovers where they do just this and Seattle has an indoor potty area for dogs. You will also need to find out the entry requirements for each country you visit. Traveling by air is far more complicated than traveling by land when you’re cycle touring with a dog. Speak with your veterinarian to help you determine the requirements for each country. Most people assume that your dog will have to be quarantined, however this is only the case with countries that are rabies-free like Australia and New Zealand. A great place to gather knowledge is PetTravel.com. Land travel usually just requires a health certificate from a veterinarian, an updated rabies shot, flea and tick medication, anti-parasite medication, and an official health certificate from the government agriculture agency. It all depends on the country. Always check entry requirements well beforehand, especially when traveling from high-risk rabies countries into lower risk rabies countries. They often require a tither test and a three- to six-month waiting period before traveling. When we go bicycle touring with our dog, our usual home is our tent, but sometimes, we want a bed and a shower. Or sometimes, it’s just not safe to camp, so we look for accommodation. Finding places that accept Sora has been surprisingly easy throughout much of our trip. Often, we book ahead when traveling to larger cities, mainly using Booking.com (which doesn’t charge the traveler service fees like AirBnB). There is nothing worse than arriving in a city after a long day on the road and then having to spend several hours looking for accommodation. Google translate can help with this when traveling in foreign lands, or you can have a bilingual person write down a translation for you that you can show to your accommodation. In countries where dogs roam the streets, untrained, that’s what people know of dogs. This is your opportunity to show them that dogs can be well-behaved beings and live in the company of humans. Depending on the length of your bike tour, there are essential items you need to bring along for your dog. In addition to obvious items like her bed, leash, food, and travel water dish, we also carry a cooling vest that will help to regulate your dog’s temperature on hot days. A running belt with a short spring leash is great for when Sora runs alongside us and Sora’s toiletry items include a Furminator, her toothbrush, toothpaste, and brewer’s yeast. 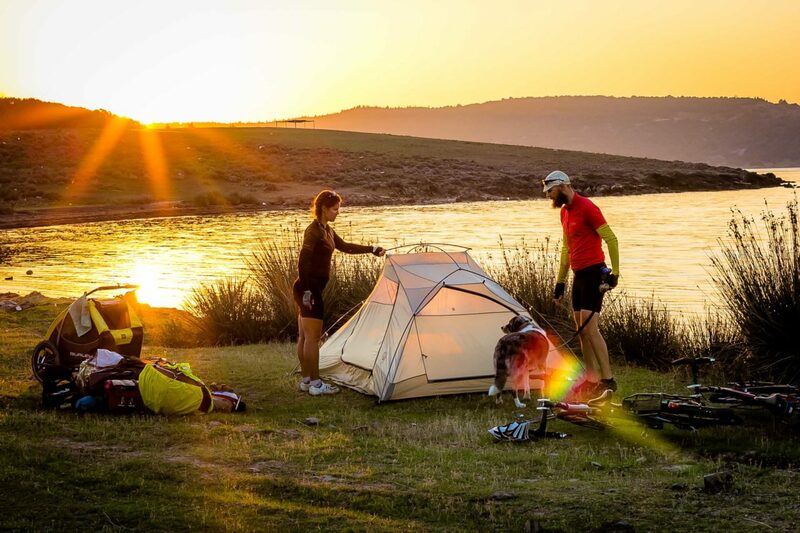 This entry was posted in Bicycle Touring Pro Articles, Featured Articles, Featured How-To Articles, Guest Posts, Main Articles, Main Featured Articles, Uncategorized and tagged bicycle dog basket, bicycle dog trailer, bicycle touring dog, bicycle with a dog, bike tour with dog, cycle touring with a dog, dog, dog trailer, Jen Sotolongo, long haul trekkers, longhaultrekkers, puppy, sora, trailer for carrying a dog with bicycle. I always wondered how it was taking a dog on a bicycle tour. There’s so much extra organisation required. Especially when it comes to international travel. I guess it makes it all the more worthwhile to have one of your best friend with you though! Having used both the Tail Wagon and the D’Lite, I’m hoping you can compare them for dog usage. I have a 40 lb border collie mix and am considering them both. Is the D’Lite worth the extra weight, size and cost? Or is the Tail Wagon, being designed specifically for dogs a better option? Thanks! Hi there, do you have any tips for training a dog to stay in and be comfortable in the trailer? Our kelpie loves traveling but we’re not sure he is loving being in our Burley Tail Wagon at the moment. We lure him with treats and put a little blanket down for him but he seems to want to hop out and has trouble staying still which makes us think he doesn’t like it. We were going to make him a seatbelt so he’s clipped into stay and can’t get out while we’re riding. Any tips from your experience with Sora? We want to make sure he’s happy! I’m so sorry for not seeing this sooner! I didn’t get an email indicating you had left a comment here. As far as acclimating your pup to the trailer, treat it like a kennel. Make it a really positive and safe space for him. Feed him his meals in in and leave it out in the home, open, so it’s not a scary thing. It’s just a part of the furniture. When he goes in, toss him a treat, or whatever motivates him. The seat belt is a great idea and we’ve done it with a puppy we helped transport for a friend, as well as our new puppy who we’re training to love her trailer. I’ve added a section on getting your dog used to a trailer in this post here: https://longhaultrekkers.com/cycle-tour-dog/. Feel free to follow up with more questions if you have them and good luck! 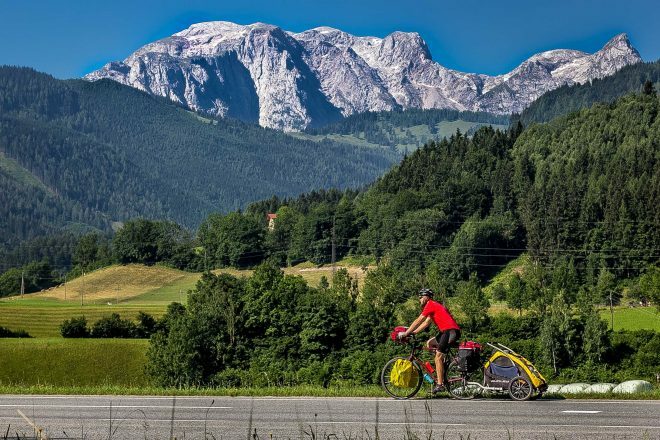 Hello nice article but can you give any advice about the best dog breeds suitable for cycle touring in dog trailers in hot weather? Feel free to message us with any further questions at info@longhaultrekkers.com.